North Texas is booming, and apartment builders are having a hard time meeting the demand. In just the last six months, developers have started construction on more than 3,200 new apartments, and more complexes are planned, according to MPF Research in Carrollton. Construction cranes tower over Interstate 35E in Dallas' Design District, where a 22-story apartment high rise, Hi Line Residential. Ebby Halliday leasing specialist Kat Garner said the Design District, as well as nearby Uptown and downtown, are in high demand. In just the last six months, developers have started construction on more than 3,200 new apartments and more complexes are planned. She said she sees occupancy rates above 90 percent at most DFW apartment complexes. "A lot of people that might have thought about buying maybe can't sell their homes from wherever they're coming from so are looking to lease to start with," she said. "You used to be able to find maybe a one-bedroom apartment in Uptown for under $1,000 and not have a problem. Now you're looking at more -- to get something reasonable, $1,100, $1,200, and going on up from there." Garner said she has a tough time finding clients a nice apartment at a reasonable price. "There are still specials out there," she said. "A lot of properties, however, are kind of veering away from the one, two and three months free and sort of offering maybe reduced rates. But the starting market rates are higher, so the specials aren't as great as they used to be." Garner advises starting an apartment search now if you are planning on moving in the next couple of months. 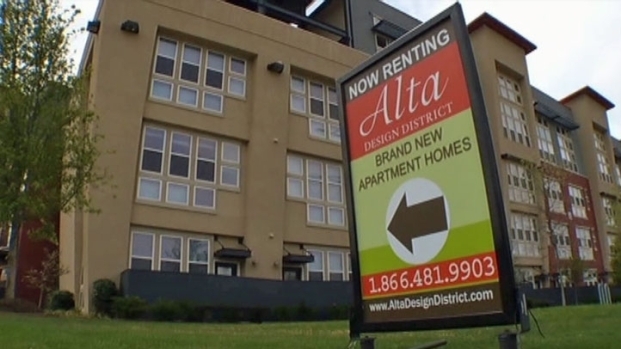 Most apartments that are under construction now won't be ready until next year or later.